Around 25 acres of lush garden and the luxury of a private beach – Roda Beach Resort & Spa is a must-stay choice if you’re looking for a relaxing holiday in Corfu. 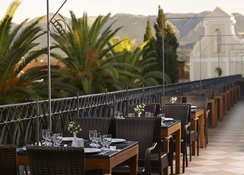 The hotel is located on the beach of Kiotari in north eastern Corfu, at a walking distance from the village of Roda. Accommodation at the hotel come in the form of beautifully decorated rooms with enchanting garden and/or sea views that have all modern amenities. A buffet restaurant with outdoor terrace, a Greek Restaurant and a Chinese Restaurant cater to the taste buds of guests at the hotel, while your drinking choices are fulfilled by a wide selection of bars, including beach bar and pool bar. 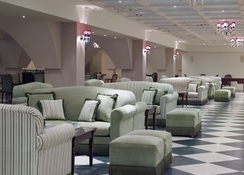 The resort also has a coffee shop, an ice-cream parlour and a souvlaki corner. Massage rooms, outdoor and indoor pools, sauna, spa and fitness room take care of the health and wellness at the hotel. The pools and beach areas are equipped with parasols and sun beds. The hotel also arranges several water sports like canoeing and water sliding. 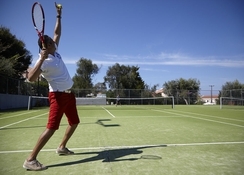 Windsurfing, horse riding, billiards, tennis, karaoke, and billiards are among other ways of getting active on your holidays. At a distance of 36 km from the town of Corfu and its Airport, Roda Beach Resort & Spa is located close to the beach. The resort is also in proximity to Acharavi Beach, Sidari Beach and Logas Beach. The resort features Family Rooms, Bungalows and Superior Double/Twin rooms. Each of these accommodations is furnished with satellite TV, air conditioning, direct dial telephone, mini fridge, twin beds, sofa and safety deposit box. The en-suite bathrooms have bathtubs and there is a private balcony in every room offering enchanting garden and/or sea views. Roda Beach Resort & Spa offers buffet and a la carte dining options at its various restaurants. The main restaurant serves local and international cuisines for all the major meals of the day. Guests can also savour Chinese, Italian and traditional Greek cuisines at the hotel. The Creperie & Gelateria serves fresh crepes, ice creams and desserts. There is also a souvlaki corner at the hotel dishing up traditional souvlaki and bread. 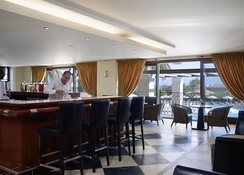 For drinks, the hotel houses a main bar, along with beach bar, pool bar and amphitheatre bar that serve drinks and light snacks. At Roda Beach Resort & Spa, there are outdoor and indoor swimming pools, spa, amphitheatre and a separate games area for its guests. The spa offers a wide range of massage therapies and treatments. Children’s facilities include mini club, kids’ pools with water slides, playground and disco for younger guests at the hotel. 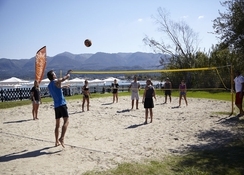 Sports lovers can choose from tennis, table tennis, beach volleyball, water polo, canoeing, windsurfing, pedal boating and several other games and sports. There’s a water sports centre at Roda Beach that offers water-ski, jet ski, paragliding, banana boat, catamaran and lots more. Booked this hotel believing it was a Mitsis as have stayed in other Mitsis hotels which are fabulous. This has been taken over by A Hotels and it nowhere near up to the standard of a Mitsis. The reception staff are unhelpful, the room we stayed in is not as advertised, the food is mediocre, however the buffet & bar staff are lovely. Beware the place has the most abundant amount of wasps we have ever seen.